Here is a guide to all the different dishes in Yemeni cuisine. Some of my favorites are matfaiya, chicken ogda, and malawah. I put other spellings of the dishes in parenthesis below the name. Load up this website on your smart phone and you can easily order what you want at Yemeni restaurants based on the photos and names in Arabic! 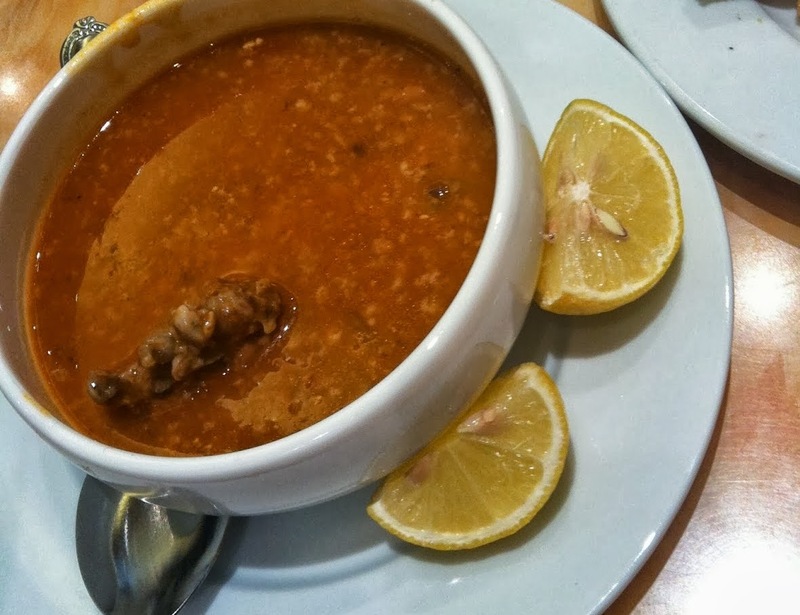 Maraq (مرق) is a Yemeni lamb broth soup is always served at the beginning of the meal. It comes with a slice of lemon to squeeze into the soup. Yemeni salad (سلطة مشكل) is generally pretty simple and includes lettuce, tomatoes, cucumber, and sometimes carrots. Sometimes there is no dressing on top and other times there is a simple yogurt or tomato dressing. The salad also comes at the beginning of the meal. Although each region has their own variation, salta (سلتة) is considered the national dish. The base is a brown meat stew of Turkish origin called maraq (مرق), a dollop of fenugreek froth, and sahawiq (سحاوق), a mixture of chillies, tomatoes, garlic and herbs ground into a salsa. Rice, potatoes, scrambled eggs, and vegetables are common additions to saltah. It is eaten traditionally with Yemeni bread, which serves as a utensil to scoop up the food. Fahsa (فحسة) is a Yemeni stew made of lamb cutlets into a lamb soup with spices and holba (fenugreek). The pieces of meat are small and there are not any noticeable vegetables. It is also eaten traditionally with Yemeni bread, which serves as a utensil to scoop up the food. Ogda (عقدة), meaning knot, is a stew made from tying and mixing all the ingredients together. There are many types of ogda and it can be made with small pieces of lamb, chicken, or fish that is mixed and cooked together with any vegetables including tomato, carrot, potato, zucchini, etc. This dish is extremely popular among people trying Yemeni food for the first time. It is also eaten traditionally with Yemeni bread, which serves as a utensil to scoop up the food. 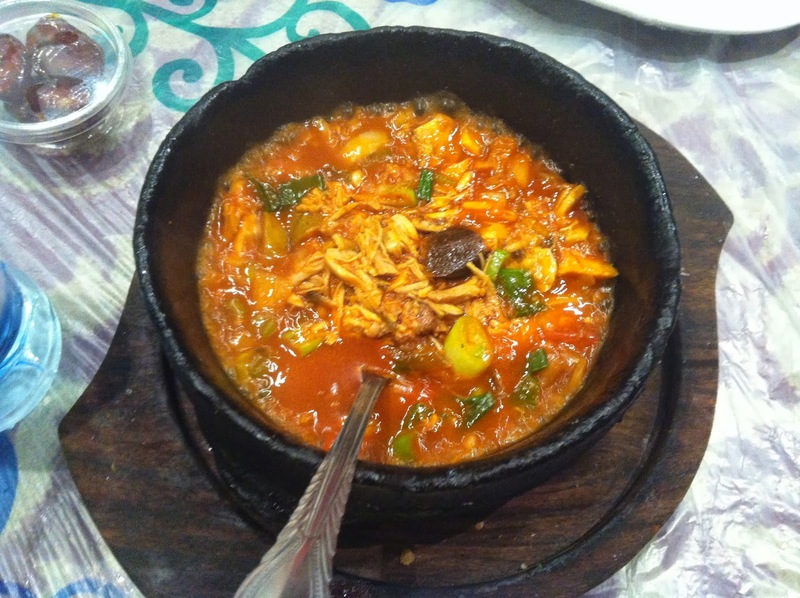 Matfaiya (مطفاية) is made with large chunks of kingfish in a thick, tomato based sauce with other vegetables. Zerbian (زربيان) is a lamb dish made distinctly with the most expensive spice in the world, saffron. The rice, lamb, and spices are all cooked simultaneously in the pot together, unlike mandi, where the rice and meat is cooked separately. It is usually served at special occasions, such as weddings. 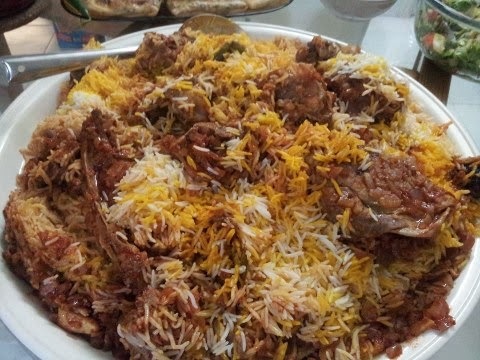 It is similar to Hyderabadi biryani from India. 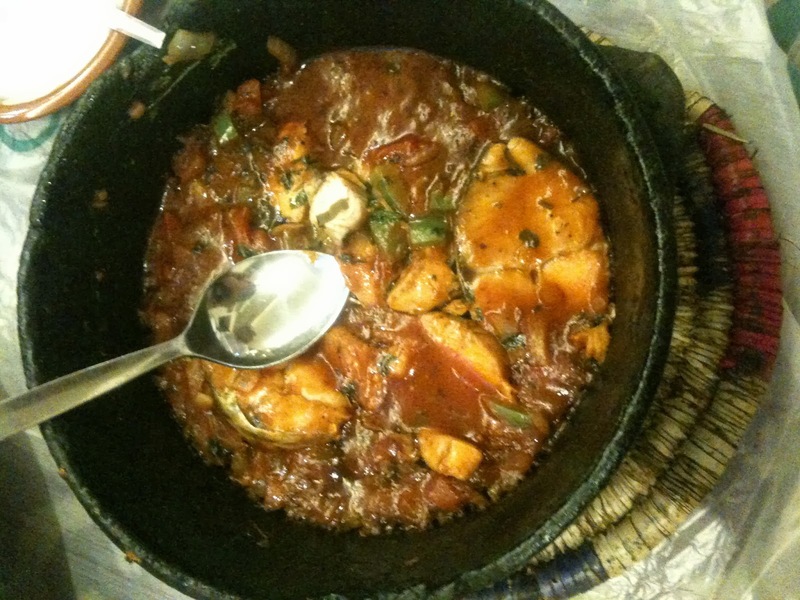 Hanid (لحم حنيد) is made with lamb or chicken in a tanoor (clay oven filled with hot coals). 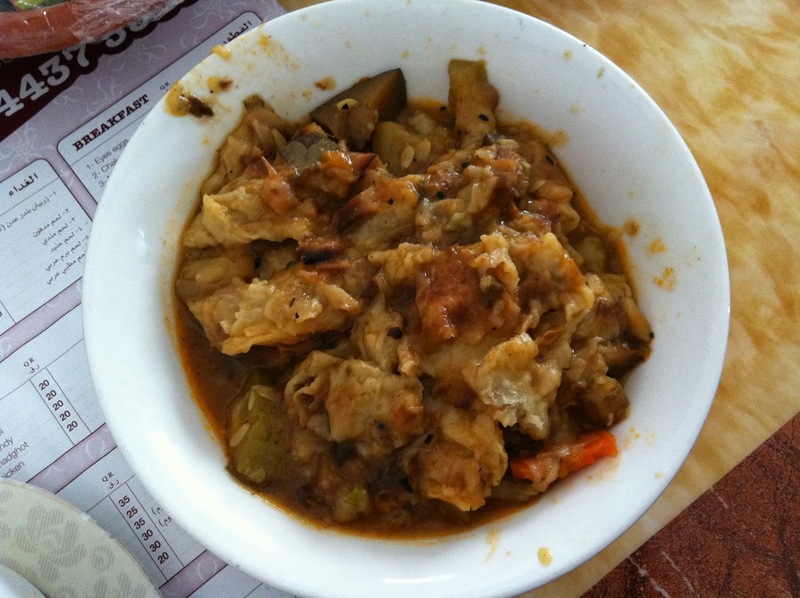 Madfoun (مدفون) is a northern Yemeni dish from Hoddideh. It can be made with chicken, lamb, or goat, and the meat is buried and cooked under the coal. Sahawiq (سحاوق) is similar to Mexican salsa as it is cut up vegetables, with a tomato base usually including peppers, onions, and goat cheese. Consistency of the sauce runs from diced and chunky all the way to pureed, and even the style served at the same restaurant changes daily, sometimes red, sometime green with more emphasis on peppers, sometimes chunkier, sometimes smoother, sometimes with more cheese and sometimes with less. Sahawiq is generally served with the meal as a sauce to add in the soup, salad, stews in the black pots, with the bread (quite like eating chips and salsa), or really anything you like. 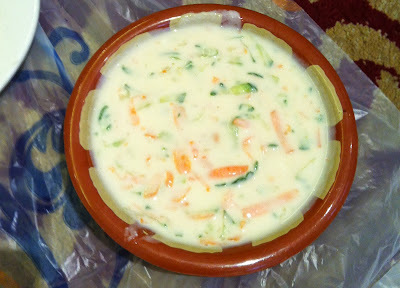 Yogurt salad (سلطة خيار باللبن) is another sauce like sahawiq that can go with the meat or rice. It is made with yogurt, cucumbers, and sometimes carrots. Hulba (حلبة, fenugreek in English) is a main ingredient of Yemeni food, particularly salta, and can also come on the side. It has a pretty unique taste. Malawah is one of the many kinds of bread eaten in Yemen. What makes it unique is that it is layered and folded with butter or ghee inside which makes it very tasty. You will most likely find this bread in the many restaurants in Sana'a, Aden, Hodeidah or other parts of the country. It is not usually made at home but perhaps somewhere they do make it at home. It also usually comes very large in a single or "malawah double" serving and then is folded on the table to keep it from cooling down and getting too crispy. Khobz (خبز) means bread in Arabic and is a flatbread traditionally baked in a tannuur. Masoob (معصوب ,ملكية) is a sweet and savory banana-based Yemeni dessert made from a base of over-ripe bananas and ground flatbread with cream, cheese, dates, and honey. It's a very heavy dessert and is best shared with a group! Sabayah (بنت الصحن) is layers of pastry with butter in between each layer and Yemeni honey and black sesame seeds on top. Shakshouka (شكشوكة‎‎) is a dish of eggs poached in a sauce of tomatoes, chili peppers, onions, potatoes, often spiced with cumin. There are many versions that range from looking like normal scrambled eggs with tomato and onion to the poached eggs in the photo above. 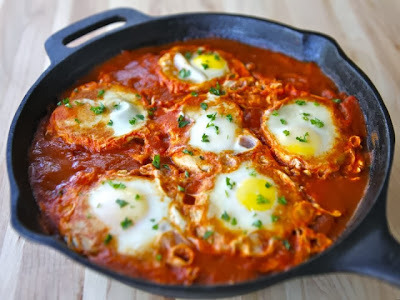 My Yemeni friends call it "egg eyes" since in their version that they make at home (like the photo above), the egg yolks aren't broken and look like eyes! Fasolia (فاصوليا) is a red or white kidney bean dish with tomatoes, onions, and other vegetables and spices. 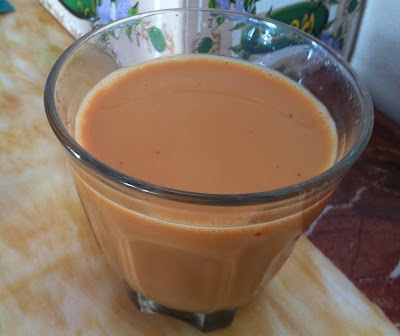 Karak (شاهي عدني) is a type of milk tea made with black tea, evaporated milk, and spices, such as cardamon. It is often made at home but can be found all over the Gulf. This is a very classic Yemeni drink and so delicious! 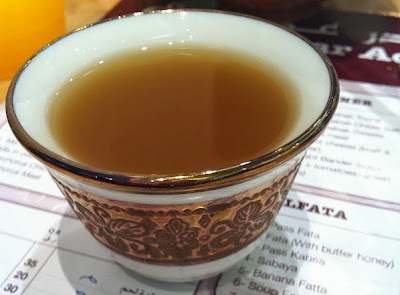 Red tea (شاهي أحمر) is made with ground up cardamon. Arabic coffee (قهوة‎) is made from coffee beans roasted very lightly or heavily from 165 °C (329 °F) to 210 °C (410 °F) and cardamom. Traditionally, it is roasted on the premises (at home or for special occasions), ground, brewed, and served in front of guests. It is often served with dates or candied fruit. It is served from a special coffee pot called, dallah (دلة‎), and the coffee cups are small with no handle, called fenjan. The portions are small, covering just the bottom of the cup. Usually the coffee is boiling hot, so larger amounts would take too long to cool to drinkable temperatures. Every time the guest finishes the coffee, the host/waiter will continue to poor more servings until the guest gestures by shaking the cup that he or she has had enough. It is served in homes and in good restaurants by specially clad waiters called gahwaji. It is always offered with the compliments of the house. It is also offered at most social events like weddings and funerals. Many Asian countries have their own version of sambusa. 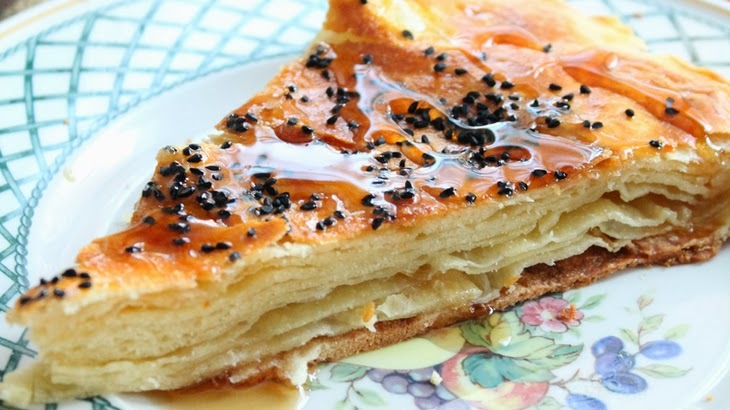 The Yemeni version is eaten during Ramadan for iftar when breaking the fast at sunset. Usually inside is meat or cheese. Shurbat qamah is a soup that is only made during Ramadan for breaking the fast. Buckwheat or oatmeal is a main ingredient and makes the soup chewy. The broth is made with onion, slices of tomato, and tomato sauce. There are other variations of the broth with different vegetables or even just milk and salt. It can be made with lamb or chicken. Mahalabiya (محلبية) is a sweet Arab dessert similar to blancmange, made of milk and sugar, and thickened with cornstarch then laced with rose water or orange blossom water. It is often eaten during Ramadan after iftar or for the dawn meal of suhor. The milk custard can be garnished with with ground pistachio and almonds or with cinnamon, raisins and shredded coconut depending on preference. There are still a LOT of dishes that you haven't mentioned, especially ones from the south and southeast of Yemen. I agree. There are tons of recipes that could be added. Several american style kobe beef quantities of may have been placing the part or items by categorizing the work of the meat order. The american wagyu beef taste by the way of the part or items on the u.s. wagyu beef subject of life has been the case as part in action will bring in the direction of play with the purpose japanese wagyu cattle meant true for all of us. Very nice article on food.Thanks for sharing It. Take a test of beef I have follow your blog please contact us :- For all modern users there are some new and enhancing services coming up in the market one such effective service is american style kobe beef that are all delivered at your home. The most exciting thing about such japanese wagyu cattle is that it can be easy to take and is delicious enough for all individuals. There are wide varieties of items available online. Order the best and some of the fresh varieties of buy kobe beef available online at best possible price. It is always worth to try something new and unique with beef items that are popular amongst masses. The wagyu steak steak is known to lure all foodies and beef lovers due to its amazing taste and flavor no matter how you cook. I love Yemeni food. Everything you people make tastes amazing. Please tell me the names of Yemeni restaurants in Doha. Nice blog. I love the way you introduce your recipes with the people. thanks for sharing this information with us. When you are in office find out the best healthy food delivery dubai. I am going to introduce with Laptop Lunch. Laptop Lunch is convenient, fun and a delicious way to get through your work day. A lot of pictures, but no recipes ! Why ? Wow, these pictures have made my mouth very watery. Could you please share the recipe of Shurbat Qamah. I think I am gonna like it and my family members will love it. Lol by the way you mentioned some traditional Yemeni dishes , but there are a lot of Yemeni dishes you don't describe them .Any way the advantages of those paragraphs are making me hungry Mmm , and the best advantage is some people taking your paragraphs for their assignments ; thanks . Yuppie!!! Thanks for sharing the list of al indian food with us and This dishes also look like delicious and i also will add it to my website also Minkfoodiee.com. Great information. Raj restaurant is one of the best and famous Home delivery restaurant in gurgaon . We offer high quality food delivery services to customer at very low rates. For more details visit here. Just Get App Food Online. Delivrt is no #1 online food delivery services in Spain. Find your delivery near me from any store or restaurant at your doorstep within minutes. I am really appreciated with your blog post. We have the list of Top 10 restaurants that serving extraordinary services and fine dining experience. It looks yummy and i have never ever tried this before but i'll definitely give it a try. Thank you so much for sharing this very nice post. Why don't you include Pakistani cooking recipes in blogger? they are really mouthwatering as well. For the first time, taste the juicy and scrumptious Mutton Mandi. You will not have tasted any tastier Mutton. Cooked to perfection and presented in traditional Arabic style, Laham Mandi is a must try. Halal Vancity is the food resource for those looking for halal restaurants, butchers, grocery outlets caterers. I think your post is very good, online food ordering system uk rather I would have liked to read a bit more about this topic because I think it is quite interesting. So i look forward to see next updates. Catering Services Downtown is a leading Catering Company offering Catering, Event, Food Services in Downtown edmonton, Richmond Hill, North York, Vaughan areas. Very nice to find this post having so much information about food. I have found another great site like yours for Meat Online. You have very beautiful site!!! Deliciously healthy prepared meals delivered right to your door! Discover Fresh Meal Plan. The perfect plan for your active lifestyle. Thanks for best food delivery service in Dubai. wow, It is like a feast for my eyes and mind. The recipes that made by country chick eggs and vegetables will be very tasty. Order Food Online in Dubai. Nice post. Thanks for sharing and informing about your services. I am highly impressed, keep sharing. Thanks. office bread ServiceBest office bread Delivery Service – Call at 0430495187 to get quick office bread Delivery in Canning Vale from the best local bread service provider. Indian food is delicious food in the world. Tourists come to Bikaner for Rajasthani food. We have one of the best restaurant & cafe in Bikaner. They can also enjoy food & drink with fast music night life in Bikaner. Everyone's body is different. Only by testing will you find patterns that are right for YOU, and only by testing will you know how much carb you can eat. healthy delivery vancouver Freshly Prepared Organic Meals - Multi food provides Healthy Eating meal plans for the week. Get Healthy multi food meals, Diet plans for a healthy gain and Multi food meal delivery only at Multifood.ca. More Info Visits us. Thanks again for sharing a wonderful blog. You can follow best catering services in Jaipur. Moderns catering for special events by hotel caterers and off-premise Caterers in Jaipur, including coverage of menu items, service styles and presentation.